Cannot execute this command without a live selected thread. It does not happen all the time, but it happens often with the Segger J-Link GDB server. It does not happen for ‘small’ programs (say less than 50 KByte). But it happens more often for larger programs (say > 100 KByte of FLASH). 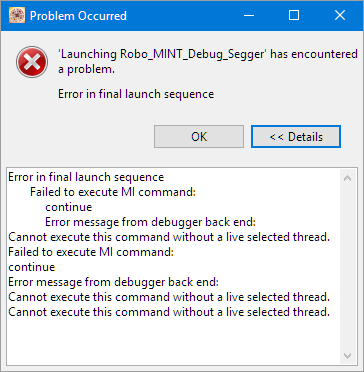 688,888 &"Cannot execute this command without a live selected thread.\n"
688,888 46^error,msg="Cannot execute this command without a live selected thread." Googling around, it seems that GDB throws this message if GDB receives a command, but has not initialized properly yet. So to me it seems that GDB is still busy with doing things after the download, and then it receives a command (in my case the ‘continue’ command), and is not ready yet. The problem is that with that error message above, I have to restart the download/flashing again. That way, GDB is not instructed to do a ‘continue’ after the download. So it will stay on the reset vector/startup. Then I simply do a ‘continue’ in the debugger UI. I searched for a ‘wait for x ms’ function in the GDB command list, but have not found anything suitable for this situation. That would have been another workaround: say wait 500 ms after the download until executing the ‘continue’ command. That way, the problem was solved for me too :-). There seems to be a timing problem between the GDB server and client. As a workaround I do not configure GDB to continue execution after downloading. This entry was posted in ARM, Cortex, CPU's, Debugging, Eclipse, Embedded, Kinetis, Tips & Tricks and tagged arm gcc, Debugging, Eclipse, Flashing, GDB, Segger, Tips&Tricks by Erich Styger. Bookmark the permalink. incredible! I was looking for something like this for a long time, but somehow missed that monitor command. It works perfectly with the Segger J-Link :-). But the Segger monitor command works, so I’m good for now, and I have updated the article. I have noticed another issue along similar lines that you had seen here when using J-link with an older project from KDS 3.0.0 opened in KDS 3.2.0. I have a project in KDS 3.0.0 that uses KSDK 1.2 along with processor expert. That project I have been using a FRDM-K64F via the 10-pin ribbon to my target using PE micro tools. All that works fine. Target is a K64FX512M12. Don’t know how to run. Try “help target”. I tried using the J-link with a demo project from the KSDK 2.1 examples and j-link and debugger worked flawlessly. I compared the two launch files (between demo project and my older project) and there is not really much difference other than project information. For fun I made them the same (using file comparison) with only project name differences and still get the same error above in my original project. Seems like my last resort here is to create a new project and move things over from the old project, but wondering if anyone else has experienced this sort of problem or if there is a better way? We have several older projects we wish to move and I don’t like the idea of rebuilding each project from scratch. 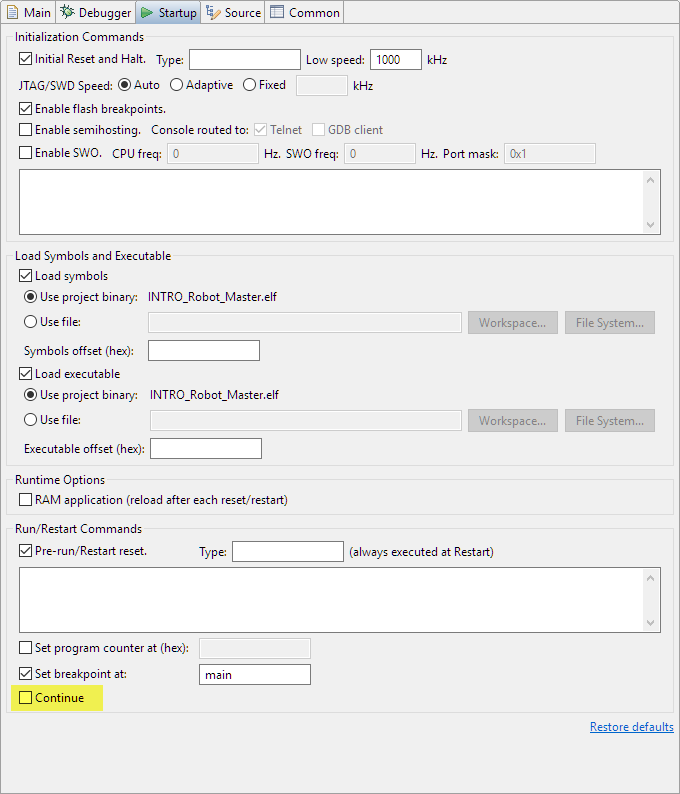 Maybe this is another possible blog item in terms of long term project management or migration upgrade strategies when using Freescale/NXP tool chains (especially what to avoid). Erich, your blog is indispensable for us out here in the wild. Thank you! it sounds that the J-Link is trying to connect to a target it does not know. Are you sure the ‘Device name’ in the Segger debugger launch settings is correct? Other than that, if you can, you might send me your ‘working’ and ‘not working’ .launch files to the email address listed on the About page of this blog, and I try to spot the problem. 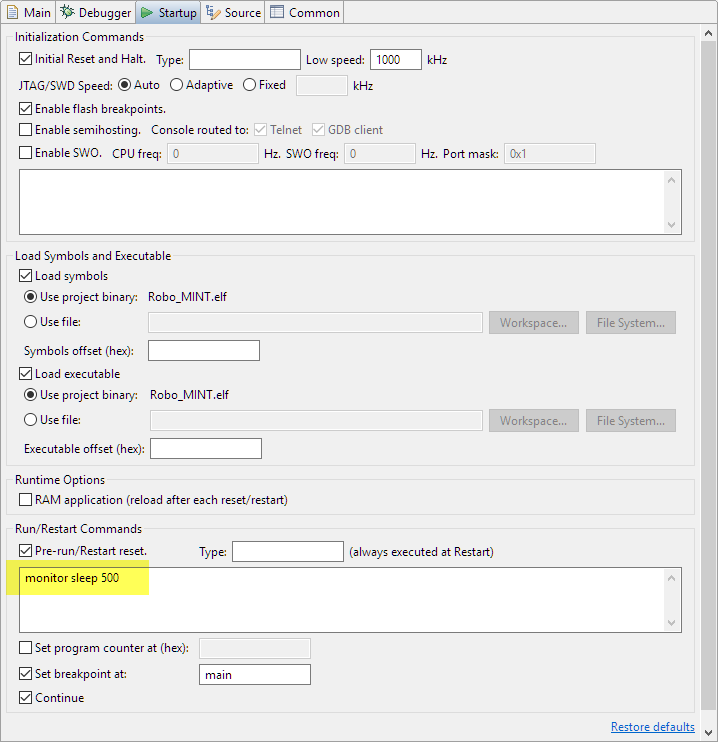 In STM32 workbench I have been getting the error. Have you tried removing some of your breakpoints? Depending on your STM32 device used, you only have 3 or 4 hardware breakpoints. Other than that, I suggest using a SEGGER J-Link as this comes with ‘unlimited’ flash breakpoints feature.